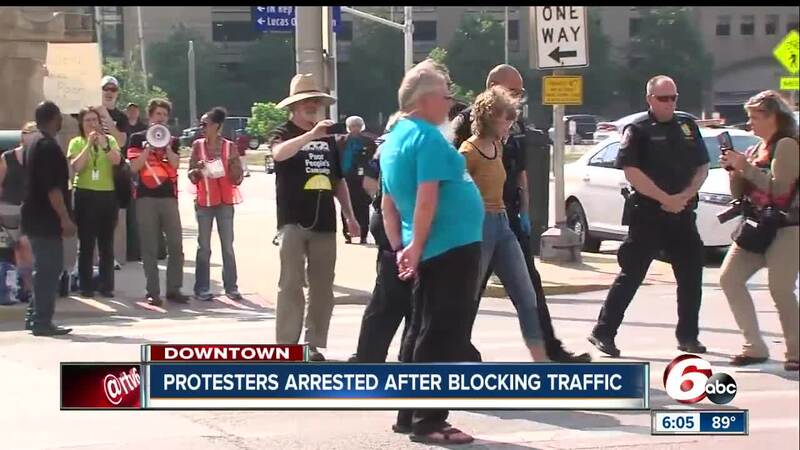 INDIANAPOLIS -- More than a dozen protesters were arrested Monday afternoon after they blocked a busy downtown Indianapolis street during rush hour. The group was demonstrating as part of the "Poor People's Campaign" and started at Monument Circle before making their way to the an area outside of the Statehouse. Indianapolis Metropolitan Police were called to the scene after reports of about 50 people blocking the road. Responding officers tried to talk to the protesters and gave them multiple warnings that if they did not leave the street they would be arrested. Police say they spoke to the protesters individually and tried to get them to move, but after being left with no alternative they took five women and nine men into custody. All 14 were arrested for obstruction of traffic. The group claims they were protesting against poverty, racism and other important issues.